Detail : 1621 Volumetric Flask grade A/B ,with ground-in glass stopper or plastic stopper. Capacity(ml): 5ml ,10ml,25ml, 50ml,100ml,250ml,500ml,1000ml,2000ml etc. 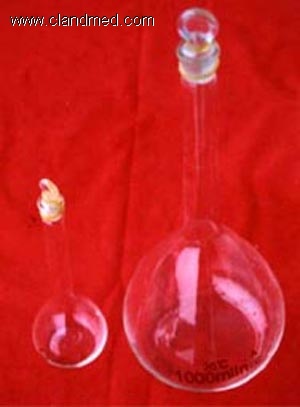 Volumetric Flask graduated one mark, with ground in glass stopper or plastic stopper. We have been exporting worldwide of our high quality GG17 Borosilicate Glassware and soda Lime glassware widely used in Laboratory. We also service our clients to source didactic & scientific products.